There is a group of Bajau Laut people (who live on boats), in front of Mabul backpacker. It blow one's mind, knowing the fact that, there is still people living under this condition. Interestingly, we observed them throughout the duration of our stay. The kids row the boat to the back of Mabul backpacker where the kitchen is located. They waited on the boat, in hope of getting some food. There is one family, where the father works at the resort next to Mabul backpacker. After having breakfast on boat, the father will row the boat to the resort and alight at the beach. Thereafter, the mother will row the boat back. The mother rowed the boat back to the same location while a naked child looked on. Another child slept on the tent and a teenage girl was seen applying white powder all over her face. This particular boat lives a family of 5 !! And it is not considered the largest number of people per boat, as we heard, there are up to 4 families live in one boat too. During lunchtime @1230pm, the mother will pick up the father, then row the boat back and have lunch on the boat. In the evening, the same routine occur again, where the mother picks the father up from work. There was a group of 4 little kids who would 'walk' from their homes (boats) to the sandy area right under Mabul backpacker workers squatters. Did you see the tiny balled-up thingy where the first kid is holding above the water? That thingy is actually a plastic-bag containing children clothes. They crossed the sea, naked and put on the clothes once they arrived the shore. :)) They did that two days in a row ! Here they were, playing under the wooden stilt house. The background song was sung by Mabul backpacker Philipino chef, Jojo. He plays a guitar and sings charmingly during his rest period. At low tide, the Bajau Laut waded the sea in search of edible seaweed. The Bajau Laut man rowed to Mabul backpacker, trying to sell all his fishes for RM30! The father rowed the boat home. Hui doesn't enjoy the snorkelling part - deep sea, waves and snorkel mask whereas En spent a great deal of time in the sea, under the scorching sun. Hui played by the white sandy beach which located next to Mabul backpacker. It can be accessed through the back door. Mabul backpacker view from the beach. She doodled in the dining room. She walked to the back of Mabul backpacker, looked at the staff hooked the fish bait. Watched the staff washing plates. Listened to the divers' briefing. We took a stroll at Kampung Mabul, and the boy who works for Mabul backpacker as boat assistant, happily brought us around. "Saya tinggal disini", so he said. (I live here, pointing to the first home). He earns a mere RM300 per month. There is only one school at Mabul Island and it is a primary school. The nearest secondary school is at Semporna, which is 45minutes away by speed boat. Most of them, do not enter secondary school due to poverty. 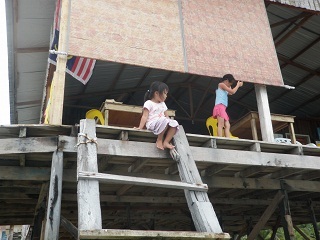 The condition of most wooden homes of Bajau Suluk people is shabby. As we walked around, the people seems cheerful and unperturbed by our presence. Front porch of a home. There are only two small shops and this is one of them. The business is run from home. A mother washed clothes the traditional way, with a basin and scrubbing board. She smiled to me while I took the shot. A granny cooked with charcoal and wood. The children created a game out of broken pencil, toothpaste cap, bottle caps and some other junks. We could snorkelled right at Mabul backpacker doorstep! Dad & En. This is En's first snorkelling trip. Hui hang onto dad - she doesn't like the snorkel mask. Snorkelling at Kapalai Island, in front of Kapalai Water Village, 15minutes away from Mabul Island. En, in yellow life jacket snorkelled among the divers. We are the only family who snorkelled whereas the rest went for diving. The tide is so low @0.2 that En and dad waddled through the sea in front of Mabul backpacker slowly, trying to avoid stepping on sea urchin, stone fish or coral. En showed me what she caught. A green leafy crab! Another light blue starfish that lazed around the stone. A black starfish with thin limb's movement. coral & variety of sea grass. There are sea snake and moral eels too, which scared En off. Mabul backpacker at low tide. a pair of starfish's movement. En caught another crab! I would have chicken-out, seeing the claw. En 's fish drawing came with a hook! The boat docked here and after struggling with the steps, the first thing we saw was the dining area. There are three long tables at the dining area where guests of different nationality dine together, at the same time. There is people from Italy, Poland, England, States, Taiwan etc ! I am always amaze by how the westerners interact with each other comfortably and able to break the ice effortlessly. En was moving about comfortably, communicating well with others, without any prejudice. Both EnHui are the only two backpacker-kids. Next to the counter (where we make our coffee/tea/hot cocoa), is the corridor which leads to the rooms. This is the corridor and the rooms. We need to walk slowly in order not to generate loud vibrating sounds from the flimsy wooden floor. At the end of the corridor, is where the toilet and kitchen are located. Our room. Hui stepped on her trolley bag to look at the marine life under the crystal clear water. The backpacker is built on the sea. The only wall fan in the room. No air conditioner. Power is available from 6pm to 6am. The bathroom is at the end of the corridor. There are 3 toilets and 2 shower rooms, with broken locks, shared by both gender! You can imagine how uncomfortable it is to bathe in there for a lady. The meal time is fixed @7am, 12pm and 7pm. Check out time is 12pm but boat to Semporna is at 4pm. If you wish to leave early, the boat charge is RM50 per pax. The side view of Mabul backpacker. This is also where we board the boat for snorkelling and diving trip. Our room window faced this direction. En Hui took their shower here! The Philipino chef, Jojo cooks really yummy food. We enjoyed each and every single meal very much. Our first lunch with banana and watermelon. Second day's breakfast. The fried vermicelli was so tasty. Lunch - looks good, right? Dinner - EnHui loved the fettucine with fresh tomatoes sauce. Third day's breakfast, with white bread. Lunch - I miss the food so much. At 330pm, there will be either pancake, doughnut or some unknown snack for tea time. This sign means you can take the food just one time. You may get a second helping when all guests have had their turns. Our box of snorkelling gears, provided with the package. RM415 per person, which include boat transfer, room, snorkelling gears, 3 snorkelling trips and full board of meal. Child pays half the price.